Recently, one of my articles, supported by pictures by VJ Sharma, was published in TOI Himachal Pradesh. Here is the entire text. Let me know what you think. Fluttering of almost a thousand pairs of wings sounds like a clap of thunder and the cacophony of their various calls, echoes all through the surrounding wetlands, resonating in the memories of bird enthusiasts long after the birds themselves have flown back to their distant homelands. These are the birds of Pong Lake, some of whom travel to Pong from as far as the Arctic Circle much to the delight of the bird watchers who eagerly wait for their arrival. What is it that fascinates us about them and drags us out of our comfortable homes to brave the chill of winter and travel great distances to get a glimpse of these beautiful creatures? The mystery no longer remains a mystery when at the slightest hint of intrusion, the placid vista of the Pong Wetlands is brought alive by the frenzied flights of these vibrant birds. Mr. Devinder Singh Dhadwal, range officer, Pong Wildlife Sanctuary, aptly calls these winged wonders the “hidden treasures” of Himachal Pradesh. Pong wetlands provide a wide variety of habitats that suit different species of birds for different purposes. While the Mud flats and mud splits, shallow and deep water, grasslands and swamps provide ideal feeding areas for birds, tree covers, sand banks, and scrubs act as the ideal breeding grounds for many bird species. So far 416 species of birds have been spotted at Pong, with the rare Falcated Duck having arrived here for the first time ever just a couple of months back. 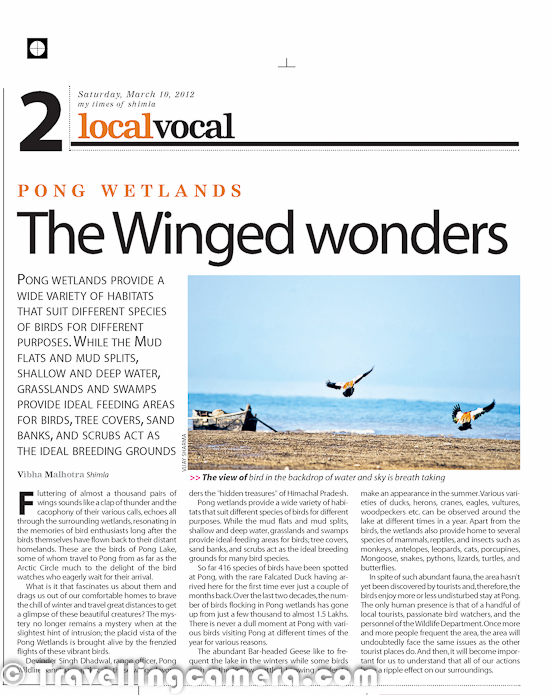 Over the last two decades, the number of birds flocking in Pong wetlands has gone up from just a few thousand to almost 1.5 Lakhs. There is never a dull moment at Pong with various birds visiting Pong at different times of the year for various reasons. 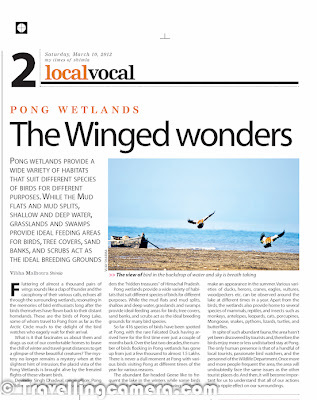 Mr. Dhadwal’s book Wild Wings: Pong & its Birds, painstakingly compiled over two years, gives a detailed account of which birds can be observed at Pong in which season. The abundant Bar-headed Geese like to frequent the lake in the winters while some birds such as the Yellow-wattled Lapwing prefer to make an appearance in the summer. Various varieties of ducks, herons, cranes, eagles, vultures, woodpeckers etc. can be observed around the lake at different times in a year. Apart from the birds, the wetlands also provide home to several species of mammals, reptiles, and insects such as monkeys, antelopes, leopards, cats, porcupines, Mongoose, snakes, pythons, lizards, turtles, and butterflies. In spite of such abundant fauna, the area hasn’t yet been discovered by tourists and, therefore, the birds enjoy more or less undisturbed stay at Pong. The only human presence is that of a handful of local tourists, passionate bird watchers, and the personnel of the Wildlife Department. Once more and more people frequent the area, the area will undoubtedly face the same issues as the other tourist places do. And then, it will become important for us to understand that all of our actions have a ripple effect on our surroundings. The first stone thrown at a flock of birds will not only cause the birds to take a flight, it may also encourage other tourists to throw stones as well. And in no time, birds may lose trust in the place and look for more peaceful grounds elsewhere. One cannot but agree with his sentiments. While most of us love to travel, very few of us give a thought to our responsibilities as tourists whereas we cannot afford to be callous towards our environment anymore. We are seeing the impact of irresponsible treatment of environment all around us. India has seen a steep decline in its vulture population. 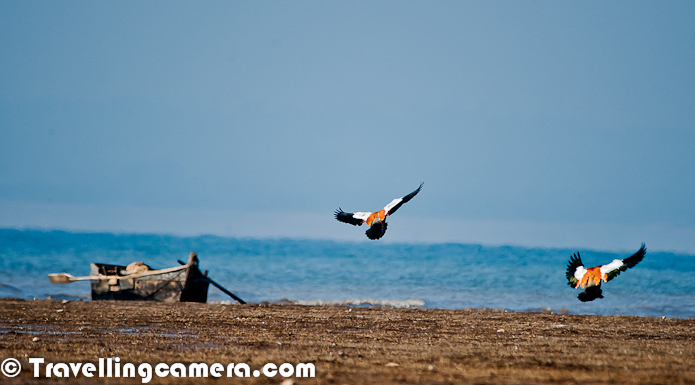 These scavengers were once frequently seen circling the skies in all parts of the country. Big cities such as Delhi and Mumbai are rapidly losing their sparrow populations. If there’s a time to change our approach towards our surroundings, it is now. Any time later than this might be too late.